Can you believe it, Christmas is right around the corner! When it comes to the end of year festivities, we want to add a crafty touch to make the day even more special and what better way to do this than by creating your own Christmas crackers? From traditional elements such as red, green and gold, to non-traditional designs including pink, rainbow confetti, and florals – trust us, there’s sure to be something here for everyone! 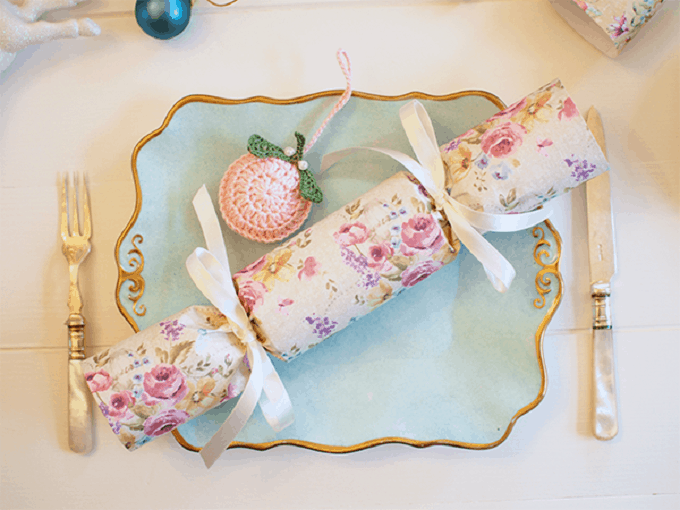 How festive are these DIY Christmas crackers from A Life with Frills? They look both super simple and fun to create too! These printable Christmas crackers via A Pair and a Spare will have you crafting up a storm in no time at all. They’re incredibly eye-catching too! Bespoke Bride has created these fun and festive Christmas crackers that can actually be used all year around – talk about versatile! Cassie Fairy will show you how to make your own Christmas crackers with a personal touch, thanks to this tutorial. We love the idea of attaching each guests’ photo to their bon bon! Polka dots and pom poms – does it get any better than that? The Creative Live blog has a tutorial to help you make these non-traditional Christmas crackers and we’re in love with them! Fancy creating some simple yet vibrant crackers for the festive season? Look no further than this fun tutorial from Design Sponge! These are some of the prettiest DIY Christmas crackers we’ve ever seen! Eleanna Kotsikou has a very in-depth tutorial for you to follow over on TutsPlus. Fall for DIY has gone for something a little bit different this Christmas and created colorful marbled crackers. What a genius idea! These wonderfully traditional crackers from Fourth and Hazel not only look good, but they’re also very simple to create! We love that extra touch of adding the guest’s first name initial to theirs too. Frankie Magazine are well-known for creating cute and quirky things, and these DIY Christmas crackers are no exception! They use paper in the prettiest of patterns for a festive craft with a difference. These monochrome Christmas crackers can be printed from Funkytime Magazine via Issuu – how wonderful! This paired-back color scheme will go with any décor too. Speaking of black and white, here’s another monochrome design from Gorjo Designs, this time featuring a beautiful font. We’d love to place these on our table this Christmas! Who wouldn’t love receiving one of these DIY Ikat inspired Christmas crackers this festive season? Honestly YUM is the talented blogger behind this crafty project. Is there anything Jamie Oliver can’t do? He’ll even show you how to create your own fun Christmas crackers that the children (and adults) are sure to love. Making your own Christmas crackers doesn’t have to be difficult or time-consuming. In fact, this tutorial from Kidspot is going to teach you how to make your own in the simplest of ways! Christmas crackers containing feathers and bells? Count us in! You’ll have to check out the full tutorial from Little Crafty Bugs to recreate your own. When it comes to DIY Christmas crackers, trust Martha Stewart to come up with the goods! You can follow her tutorial and feel free to mix and match your own designs with your favorite colors and patterns. 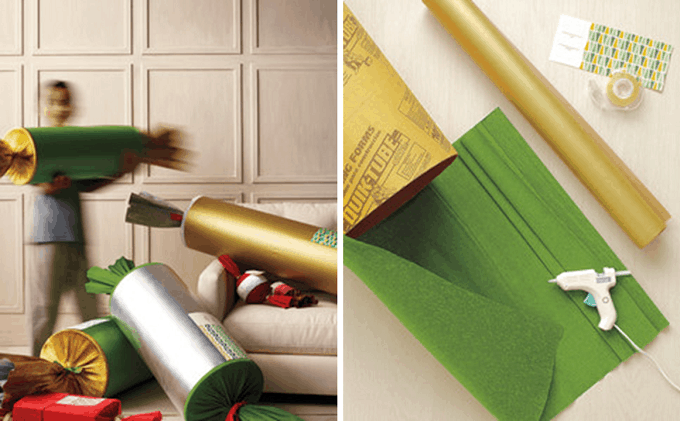 Why not create over-sized novelty Christmas crackers this year for something a bit different? Martha Stewart will show you everything you need to know! We’ve fallen head-over-heels in love with these DIY festive bon bons from Mollie Makes. They’re almost too pretty to pull apart! If you fancy adding some glam Christmas crackers to your table this year, then you won’t want to miss this DIY tutorial from Moms & Munchkins! We love the added bling. Want to cater for the kiddies this year when it comes to Christmas crackers? Mr Printables has you sorted with these DIY designs that you can print yourself for free. Here’s something a bit different! Oh Happy Day has created large candle crackers which can be used at both Christmas time and on birthdays. How clever! Speaking of Oh Happy Day, she’s also made these pretty-as-a-picture bon bons with plenty of pink and confetti – how gorgeous! These can be used as an alternative Christmas cracker, or why not create one for your love on Valentine’s Day? When it comes to Christmas, sometimes we think ‘the more gold, the better!’. Squirelly Minds has definitely embraced this with her sparkly DIY Christmas crackers. Trust the gang at Style Me Pretty to put together these feminine and stunning DIY Christmas crackers. We love the pink, white, and gold color palette too! Here’s a unique but inexpensive DIY tutorial from The Debrief! Simply rip out your favorite magazine pages and use them to wrap your bon bons – too clever! If you want to create your bon bons using as many different colors and patterns as possible, then we suggest checking out this DIY project from The Paper Caper. They work together brilliantly! These DIY crackers from Thoughtfully Simple might seem cool, but we think they’re also very on-trend with their patterned tissue paper too! Why not embrace a pink Christmas? Three Little Monkeys Studio has done just that and crafted these DIY girly crackers. These DIY Christmas bon bons from Torie Jayne have that vintage and feminine twist that we love! The gold combined with delicate florals is a match made in heaven. Brown paper is one of those items you either have lying around at home or at your local shop, so why not create some amazing crackers from them this Christmas? You’ll find everything you need to know at Twin Dragonfly Designs. Christmas crackers using leftover wallpaper? Count us in! We love that the sky is the limit with this DIY project from Yves Town. There you have it, 32 DIY Christmas crackers which are sure to spread the festive spirit! Which projects were your favorite? We’d love to hear from you in the comments section below!